Scoreboard watching, if you will? More than 30 years after Dodger Stadium unveiled one of the first full-color video screens in sports in 1980, ANC Sports debuted the first 10mm surface mount LED displays in baseball at the third-oldest ballpark in the major leagues during a March 29 spring training game. ANC deployed a pair of 1080p HD video screens, one in left-center field and the other in right-center. Both displays are designed in the historic hexagonal shape of the stadium’s original scoreboard and will feature a total active viewing area of almost 2,500 square feet. The new hexagonal shaped displays measure almost 78 feet wide with varying degrees of height. In the center, the video screens are almost 38 feet high while the ends of the screens measure almost 24 feet high. Although the new board pales in comparison to ANC’s work at Safeco Field, where the Seattle Mariners will unveil a 200-foot-by-62-foot record-setting display next week, the company and team are happy. “We were asked to incorporate modern technology into an iconic ballpark without installing something that doesn’t fit in terms of the feel,” says Chris Mascatello, executive VP of technology sales and services for ANC Sports. The displays—which include enhanced statistical information—will be operated by ANC’s VisionSOFT, which is designed to display large 1:1 greater than high definition resolution content. VisionSOFT and the 1080p control room infrastructure will maximize the image clarity and continuity across more than 2.3 million pixels on each screen. The new scoreboard structures will also feature a 10mm LED strip measuring approximately 6 feet high by 69 feet wide beneath each video screen. 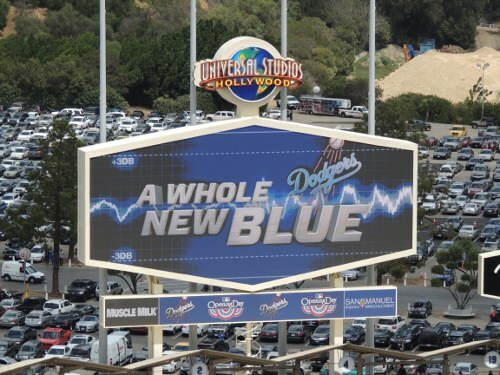 ANC is integrating two outfield video wall displays, each measuring approximately 6 feet high by 61 feet wide, and an LED ribbon system along the club fascia that runs for 1121 feet. The entire display system will be capable of seamlessly transitioning between statistics, animated content, sponsor engagement and fan interaction. That aforementioned Safeco Field board also looks pretty damn cool. At 56.7 feet high by 201.5 feet wide, covering 11,425 square feet, it's the largest in the majors-—and among the largest in all of sports, just shy of the standard bearer at Cowboys Stadium. But hey, we've got pixel density. Take that.